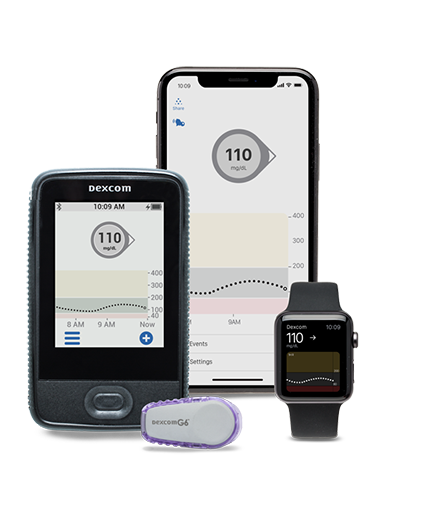 Now with the Dexcom G6 Continuous Glucose Monitoring (CGM) System, make better diabetes treatment and diabetes management decisions with zero fingersticks and no calibrations. * The Dexcom G6 lets you see your glucose numbers — with just a quick glance at your smart device† and receiver. Get alerted when your glucose levels are heading high or low and share your data with up to 10 followers.‡ The Dexcom G6 is covered by most insurance plans. 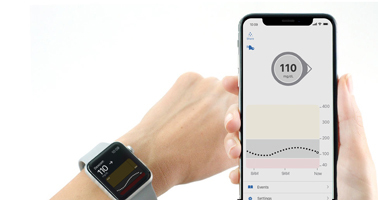 Always know your number with just a quick glance at your smart device.† Trend lines show you where your glucose levels are headed and how fast they're getting there, so you can take action. FDA-permitted to allow for zero fingersticks. Set your range and get notified when you're heading high or low. See glucose data in real time on your compatible smart devices. Share your glucose data with up to 10 followers. 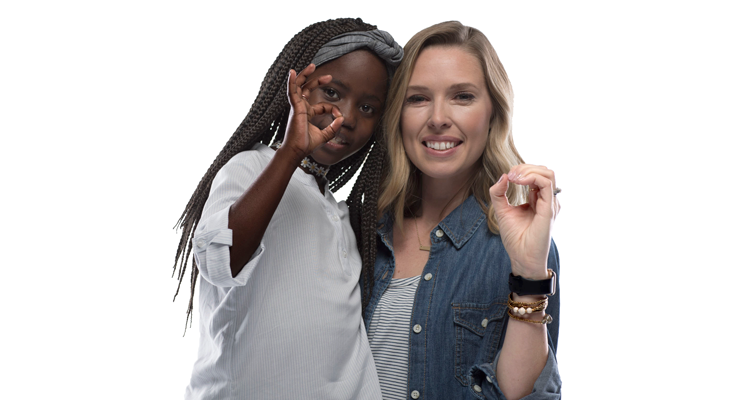 The only provider of CGM systems indicated for children ages 2 years and older. The slim, water resistant sensor§ is discreet and easy to insert. Please note the form below is only intended for new customers. If you are a current Dexcom customer, please click here for more information. Please fill out the information below to help us determine if the Dexcom CGM is right for you or your loved one. A customer representative will follow up with you to process a full insurance benefits check after reviewing your information. If you have Kaiser Insurance, please contact your provider for more details. All fields marked with an asterisk (*) are required. All the information you provide is sent securely. 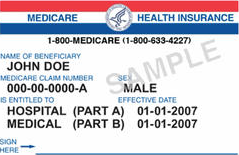 If you obtain an official Medicare Health Insurance card with a red, white and blue horizontal stripe at the top, please select "Medicare" as the Medicare Type. In addition, by checking the applicable box(es) below, you are agreeing to receive at the phone number set forth above, automated phone call and/or text communications, including pre-recorded and auto-dialed communications from or on behalf of Dexcom, Inc. ("Dexcom") concerning the marketing and sale of Dexcom’s products and services: you certify that a) you are the account holder and consent to enroll or have the account holder's consent to enroll and b) you are age 18 or older. Your service provider's airtime, message, and data rates may apply. Your consent is not required for purchase. You may opt out at any time by texting "STOP" in return to a text, calling Dexcom at 888-738-3646 or sending an email to privacy@dexcom.com. Our customer support representatives are available to help answer your questions at 888-738-3646. † For a list of compatible devices, visit www.dexcom.com/compatibility. ‡ Separate Follow App required. § The Dexcom G6 Sensor and Transmitter are water-resistant and may be submerged under eight feet of water for up to 24 hours without failure when properly installed. Failure to use the Dexcom G6 Continuous Glucose Monitoring System (G6) and its components according to the instructions for use provided with your device and available at https://www.dexcom.com/safety-information and to properly consider all indications, contraindications, warnings, precautions, and cautions in those instructions for use may result in you missing a severe hypoglycemia (low blood glucose) or hyperglycemia (high blood glucose) occurrence and/or making a treatment decision that may result in injury. If your glucose alerts and readings from the G6 do not match symptoms or expectations or you’re taking over the recommended maximum dosage amount of 1000mg of acetaminophen every 6 hours, use a blood glucose meter to make diabetes treatment decisions. Seek medical advice and attention when appropriate, including for any medical emergency.